Flashback Friday** has been so successful that Azurafae, Tatman, and myself, Citizen Agent, decided to continue it for another year with a different spin on it. This year we will be taking turns counting down our personal favorite 17 skulls from the Original 365.25 Year. This is a perfect opportunity to visit the archives as well as get to know your editors a little better as we will be adding some additional commentary on some of the original pieces. In doing so, perhaps you may discover some of what it is that drew us getting more involved currently with Skull-A-Day. Something that surprised me with the flashback countdown last year was finding out how many of the original skulls I missed commenting on. It seems my favorite list is not starting out much better, as I have found yet another I missed. One of the things I remembered most about this one was how a specific moment in time was captured in this picture with the birds circling overhead. It reminded me that we are also just a moment in time, and that no matter how we try to repeat something it can never be the same. In doing “C-Rations” each week I discovered the large number of pictures I take just to get that one “good” shot. I can imagine how the same was true for this image. The birds, being traditionally tied with death in folklore, work beautifully with the skull because it looks like an unspoken message is being sent altering them to the location of the of the departed. 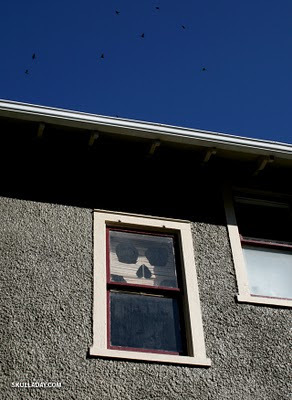 I always wondered what this skull looked like with the blinds in the down position. I'm glad you appreciate the birds in the shot. If I recall correctly, that was the only shot they were in! The shade didn't work after I cut it up (and used tape to keep it from falling apart), so there really was no down position for it to go to!